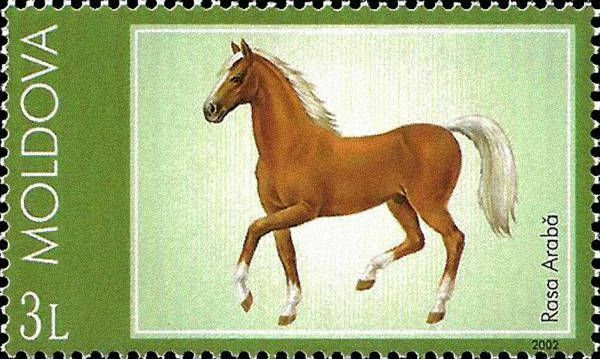 On 20 September 2002, the Post Office of Moldova (Poșta Moldovei) issued a series of postage stamps with the title Horse Breeds. The issue comprises three stamps, with associated cancellation (postmark) and first day cover (FDC). The designer was Oleg Cojocaru. The printing was performed by Bundesdruckerei, Germany. The Vladimir Heavy Draft is a breed of draft horse which comes from Vladimir, in the former USSR, in Russia. 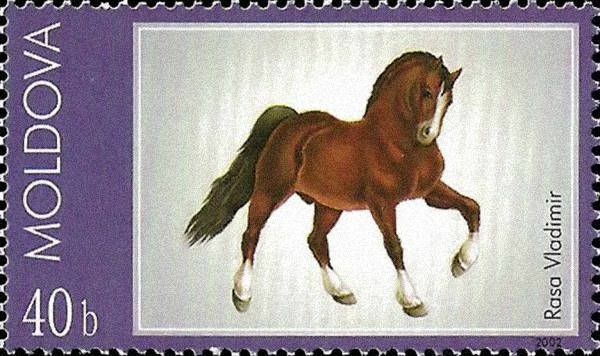 It is a strong horse that is an all-around draft horse of medium size. Read more.. This article uses material from the Wikipedia article 'Vladimir_Heavy_Draft', which is released under the Creative Commons Attribution-Share-Alike License 3.0. The Orlov Trotter (also known as Orlov; Russian: орловский рысак) is a horse breed with a hereditary fast trot, noted for its outstanding speed and stamina. It is the most famous Russian horse. The breed was developed in Russia in the late 18th century by Count Alexei Orlov at his Khrenovskoy Stud farm near the town of Bobrov (Voronezh guberniya) . The Orlovs emerged as the result of crossing various European mares (primarily of English, Dutch, Mecklenburg, and Danish breeding) with Arabian stallions. Read more.. This article uses material from the Wikipedia article 'Orlov_Trotter', which is released under the Creative Commons Attribution-Share-Alike License 3.0. The Arabian or Arab horse (Arabic: الحصان العربي ‎ [ ħisˤaːn ʕarabiː], DMG ḥiṣān ʿarabī) is a breed of horse that originated on the Arabian Peninsula. With a distinctive head shape and high tail carriage, the Arabian is one of the most easily recognizable horse breeds in the world. It is also one of the oldest breeds, with archaeological evidence of horses in the Middle East that resemble modern Arabians dating back 4,500 years. Throughout history, Arabian horses spread around the world by both war and trade, used to improve other breeds by adding speed, refinement, endurance, and strong bone. Today, Arabian bloodlines are found in almost every modern breed of riding horse. Read more.. 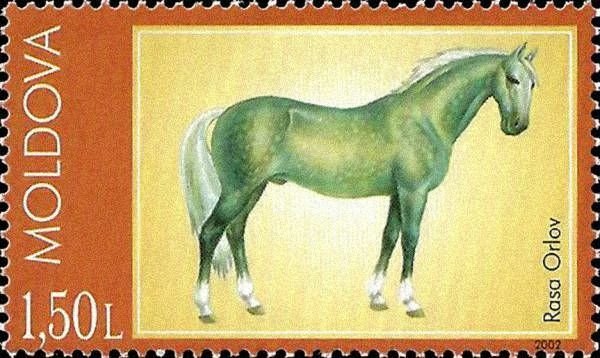 This article uses material from the Wikipedia article 'Arabian_horse', which is released under the Creative Commons Attribution-Share-Alike License 3.0.